Teresa Salvia (s.greggii 'teresa')- Also called Autumn Sage or Teresa's Texas Sage. 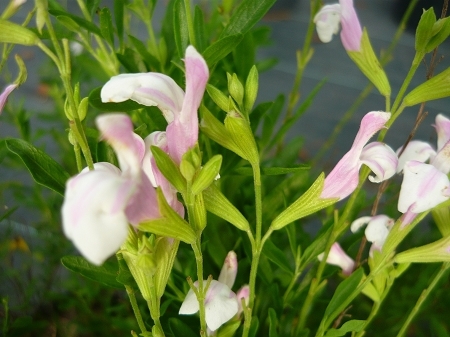 Unusual colored salvia features beautiful pale pink and white blooms. Will attract hummingbirds to the garden. Forms a small bush approx. 3' x 3'. Very drought tolerant once established. Reported to be deer resistant. Sun, easy to grow perennial zones 7-9. Live plant in 3 inch container.